While all this was going on a host-powered Plextor PX-L611U DVD-writer was playing a DVD of Human Remains with the audio routed through the dock’s stereo output. 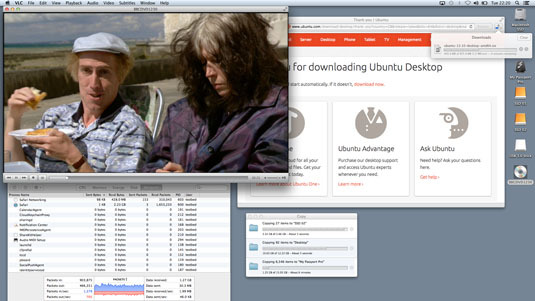 The HDMI output was also driving a second monitor where all this activity was going on, together with a web browser was downloading Ubuntu Linux from the Ethernet port at around 2MB/sec, all without a hitch. By the way, the audio input is mono-only and the stereo output maximum resolution is 16-bit at 48kHz, but defaults to 44.1kHz, namely, CD-quality. This resolution and I/O arrangement for the analogue audio interfacing is also the same for the Belkin Express Dock and the Matrox DS1 too. Tests with the Thunderbolt-equipped HP ZBook 17 mobile workstation reviewed recently, were not quite so plain sailing as the Mac. The problem was that a couple of interfacing options weren’t showing: Ethernet and USB. The reason wasn’t so much an Elgato issue, as an OS shortcoming. The ZBook 17 was running Windows 7 and for PCs connecting to the Thunderbolt Dock, Elgato specifies Windows 8.1 or higher, which no doubt has all the relevant drivers locked and loaded. All was not lost though. 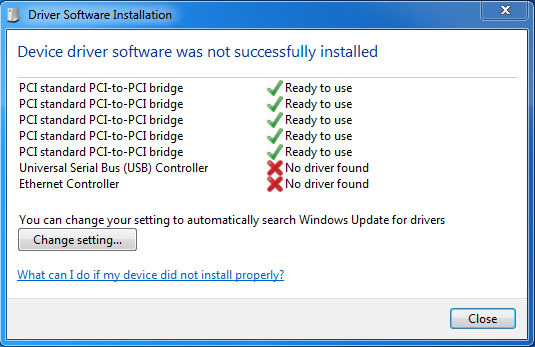 After a quick chat with Elgato’s UK PR bods, the ZBook 17 Windows 7 issue was quickly and simply remedied with a couple of driver downloads for the Intel L210 Ethernet controller and the Fresco Logic USB 3.0 controller (FLUSB3.0-3.5.106.0). After that minor detour, everything worked as expected on the PC side of things too. Elgato’s Thunderbolt Dock is compact, with a useful array of well-spaced interfacing, so that it shouldn’t be a problem fitting all your cables and thumb drives into it. With some encouragement, it even supports Windows 7, which isn’t mentioned on the box. However, Windows users might want to consider a USB 3.0 dock, such as the Startech dock we reviewed in this round-up, which could save a few quid, as Thunderbolt kit retains a price premium and the Elgato is no exception here, alas. Thunderbolt dock with USB 3.0, Gigabit Ethernet, HDMI and audio interfacing with daisychaining support to other Thunderbolt devices.